Ongoing research, day in day out, has put Acústica Integral into a leading position in the acoustics field. Our research means that we can face the future with optimism while we meet the challenges of the present. More then 25 years of experience. Export to over 25 countries. We can guarantee the effectiveness of our products because we have tested them. In our acoustics laboratory we put our products through the most exhaustive tests. We check the performance of different products, of product combinations and other solutions in all kinds of situations. Only because of this can we give a 100% guarantee on all the solutions we offer our clients. Acústica Integral can rely on the most experienced and eminent technicians in the acoustics field. A broad team of specialists in different fields that work together to offer you the best service. Our clients reap the benefits of a team that examines acoustic problems with the necessary global vision and with absolute mastery of each technical area. The projects office can design solutions for any kind of situation or context. Our technicians have a thorough knowledge of the materials and the processes of installation and manufacture. Thanks to this overall know-how, they can design better and more cost-effective solutions. Designed by our Technical Office for ease of installation, appearance, toughness and durability. In our workshops we make tailored and standard products with strict quality control. At Acústica Integral we have installation teams that specialise in different materials and assembly systems. All of our operators have long experience in acoustic installations, so they work fast and to the highest standards. 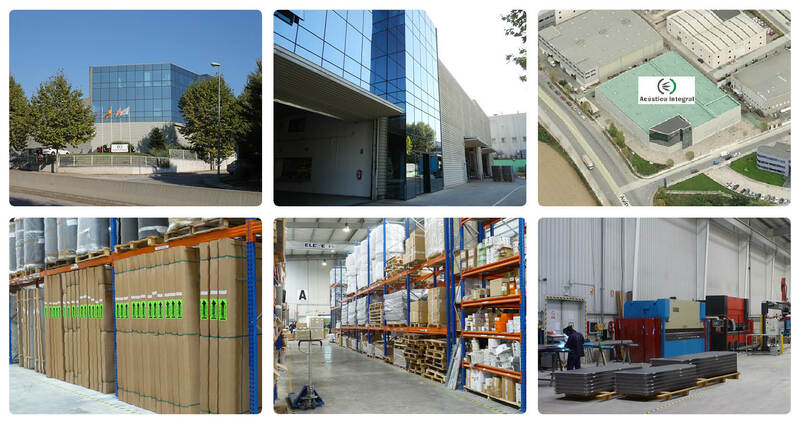 In our facilities are allocated a several areas of storage products on are of over 2.500 m² for an efficient, quickly and accurately logistics. The ideal solution to every noise problem is obtained through a combination of work experience, precise calculations and, of course, the best materials, together with sound installation procedures. We have a range of materials to meet all needs and the confidence that comes from the guaranteed testing of our materials.